During the Regency era, you were bad ton if you saw a ghost. You were queer in the attic if you admitted you had. For example, Monk Lewis’ wildly popular play, The Castle Spectre, was still being criticized after years of successful productions for the “nonsense and absurdity” of its supernatural theme. The play’s “special effects” were deplored–the “spectre” condemned as a public nuisance for attracting large crowds of boisterous, lower class patrons clamoring to see it. H’s account takes place in the Devonshire village of Starcross, beside the Exe estuary. Starcross is just south of Powderham Caste, seat of the Courtenay family, Dukes of Devon since the 14th century. The next day, sitting in an outdoor alcove to await Staples’ arrival, H perceived the sound of a death-watch, “that little insect of inauspicious augery.” He thought nothing of it, dismissing it just as he had the sudden shriek of a screech-owl. On his return to the house, however, he had reason to recollect these portents, for his servant handed him a black-sealed letter. Sadly, H made his way to his library, accompanied by a faithful spaniel. Once in the chamber, however, the dog let out a horrified wail, peering with fright toward the back of the room. There was Staples, sitting motionless, upright, in a chair. It was the spaniel’s fault, H reasoned, for causing his master to quit the chamber in unseemly haste. Why else would the spaniel be in terror unless it was due to the supernatural, the beast having no such knowledge of ghosts and such? Nevertheless, H’s good sense finally prevailed and he returned to his library, only to find the image of Staples was still there, seated with his eyes closed. One can only imagine H’s chagrin when Staples, in high good humor, assured his friend he was not a ghost. 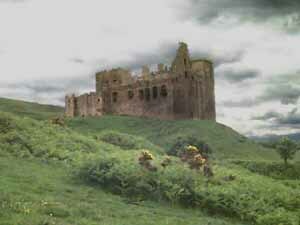 Indeed, it was a namesake of his, living in Castle-street, who had died. Unfortunately, some “loud-mouthed fool” had spread the false news to Staples’ clerk, who then conveyed the misinformation to H.
Imagining his friend’s turmoil upon receiving such a bag of moonshine, Staples made haste to Starcross to rectify the error. He let himself in the side door of the house and sat down in the library to await his host with the good news he was very much alive. His motionless appearance was explained by reason he’d fallen asleep. The dog’s reaction was simply a case of dislike for Staples, who had strongly chastised him on an earlier visit for killing a chicken. The Author wisely refrains from commenting further on his own reaction, and leaves it to us to contemplate ours. Viscount Combermere, investigator of the famous moving coffins in Barbados, was struck and killed by a carriage. 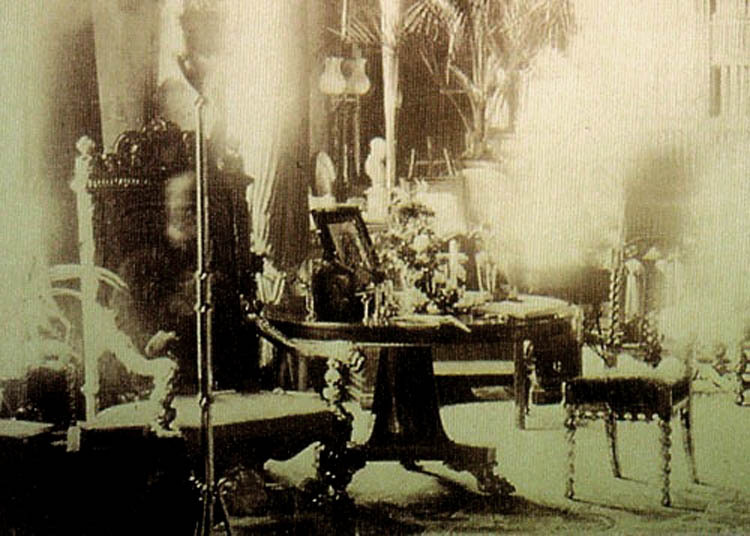 During his funeral, this photograph was taken of his favorite chair, while the house was empty. This entry was posted in Regency, Uncategorized and tagged 2nd Viscount Combermere, Castle Spectre, Devonshire, Monk Lewis, Reverend C. C. Colton, Sampford Ghost, Starcross Apparition by Angelyn. Bookmark the permalink. I love the role of the dog in this tale! Honestly, if I believed that every time one of my pets behaved oddly it was an indication of the presence of spectral phenomena, I would be a candidate for Bedlam. The way my cat stares in the gloom, her iris so big her eye is completely black–well, it gets me going, too. I extra-adore closing it out with a King quote! Yay Angie! I thought the same thing, too–I’m always hungry and so can totally relate to both natural and supernatural gluttony! and of course he’d need a drink!